Thanks for the video, there's some useful advice in there. If i try to move move my finger up so that the crease doesn't fall on the B string anymore, then it falls on the G string. I can't find a way to move it just between the two strings. I wonder if I should just keep practicing my barre chords like I do (second picture) even though the B string still buzzes a little. Will it stop buzzing after some time? Well, in the video he explains that the crease thing is irrelevant as long as you straighten the index finger enough. 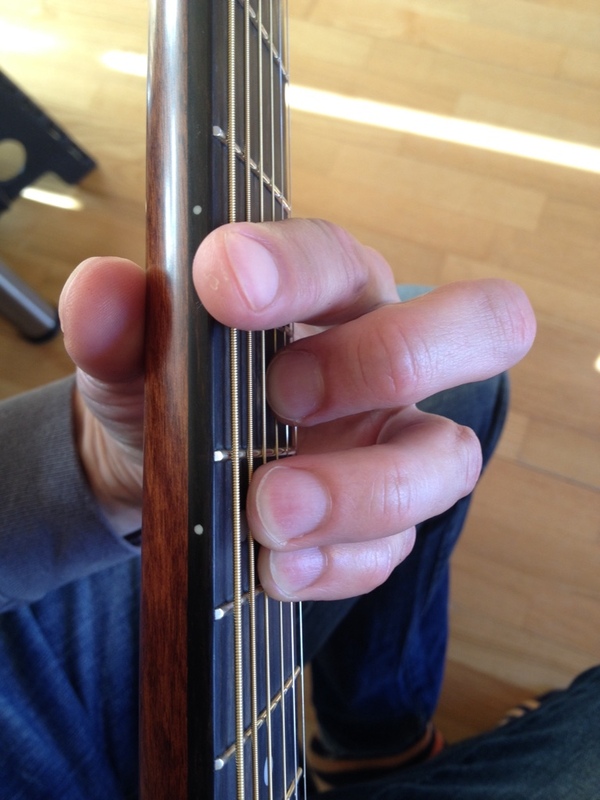 The B string will stop buzzing after a while, but you should keep practicing to get it right! What about my thumb position. Is it fine on the 2nd picture? I tried to emulate your thumb position and it feels wrong to me. I feel a strain just above the wrist. Here is a picture of my grip. How come every time I play a barre Chord the 6th string almost never rings out but all the other strings do. Increase the pressure of the tip of your index finger to ensure its cleanly fretting the 6th. Practice barring with just the one finger to get a feel for just the right amount of pressure. Thx man, that was quick lol. I would use the acoustic to build up strength, say 50/50. Even days acoustic odd days electric. The Maj Barre Chords are sounding great. Every string but I have a huge problem with he min. The G string is the problem. Doesn't matter how hard I press I don't get a sound out of it. Even when I move the finger up or down. I don't find the position. I struggle with the G string as well. The problem for me doesn't seem to have anything to do with the barre... it's my pinky finger, it's always muting the G string. It's definitely more of a problem on the minor shape but sometimes on the major shape as well. Also I don't seem to have a problem if I'm low down on the fret board, ie playing an F minor chord is not a problem, but playing something like a D minor chord at the 10th fret is more or less impossible. My hand feels like it's getting squished and my pinky ends up muting the G string. Basically the higher up the fret board the worse it gets. I'm really trying to arch my pinky but it's tough. Anyone else have this problem and have any tips for it? Try to get your palm more parallel to the neck. This should improve the angle of your pinky and avoid muting. I've been practicing the guitar for 3 weeks now, I thought that I couldn't nail those bar chords because of my lack of strength. but when I took a look at my finger, I noticed that my finger gets fatter the lower it is from the tip. So, what I did was including how Justin said that need to roll it sideways, also slide it upwards and just like that, I nailed my bar chords in less than an hour trying!! Officially completed the BC (feel confident in everything I learned, and have a repertoire of about 30 songs I can play through, though most are not memorized I can refer quickly to some notes I kept to remind me of the specific techniques for each song). Note moving onto the IM course and starting my barre chords. I can already tell I'm going to have issues in the meat between my thumb and first finger. That area is where I get tired and feel like I have to stop and rest after 5 or 10 minutes of constant barres. I noticed no one else has mentioned this. Any solutions? Or is this just a muscle that's weak and needs to be strengthened over the next several weeks?